The bibingka is a rice cake popular in the Philippines and made of basic ingredients consisting of rice flour, sugar, butter and coconut milk. Cooking bibingka involves placing burning coals on top of and under the bibingka mold while placed on a clay pot. The bibingka has a spreading of butter or margarine, topped with sprinkled sugar and grated coconut. Young banana leaves heated over a small flame would wrap or line the bottom of the bibingka when sold to customers. Although a popular street food, it is usually in demand with locals and even tourists during the Christmas season when it is one of the delicacies sold by vendors outside the churches after the traditional night mass or Simbang Gabi held from December 16 to 24. There are many versions of bibingka in Cebu but the most famous is the bibingka of Mandaue City because this type uses manually pounded rice instead of the commercially available rice flour. The Mandaue bibingka consists of pounded rice, coconut milk, white or brown sugar and either yeast or tuba. The tuba is the country’s local version of the coconut wine and is sometimes used in place of yeast in order to increase the size of the rice cake. Only a few bakers in Mandaue City offer this type of bibingka. 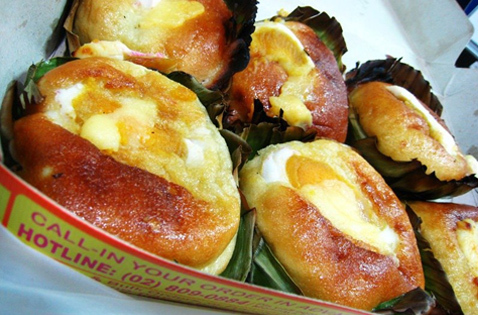 Another type of bibingka in Cebu is the roadside bibingka offered by vendors who are stationed beside the major highways or roads in Cebu especially the thoroughfares leading to the province’s tourist destinations. The roadside bibingka is smaller than the regular bibingka and cooked using makeshift stoves made of galvanized corrugated iron sheets. This type uses burning coconut husks above the stove and some hot embers of husks under the stove. The most common type of bibingka is the one offered by vendors outside the churches at the end of the dawn masses during the Christmas season. The vendors selling this type of bibingka are seasonal vendors who want to earn extra income during the holiday season. Therefore, they would just use the cheapest ingredients and not use the most expensive brands of ingredients.